Chrichton's World: ReviewThe World Is Not Enough (1999): Solid but that is about it! 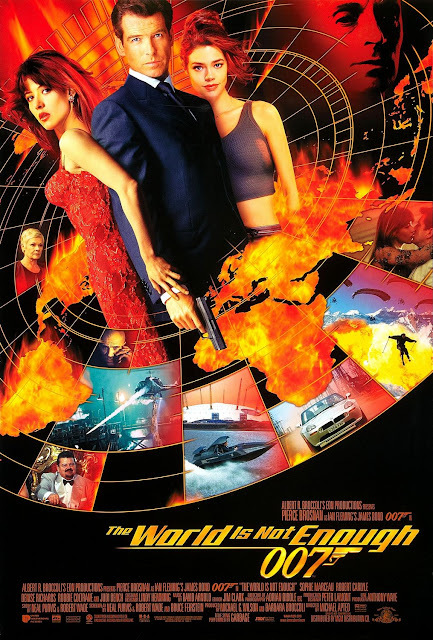 ReviewThe World Is Not Enough (1999): Solid but that is about it! The first time I saw The World is Not Enough (in the cinema) it was exciting. The multiple times after it felt underwhelming. Still solid but that is about it. So what is the cause of this? What makes this Bond film less fun and exciting at repeated viewings? In previous films the plots were in service of the action and less reliant on surprises as in twists and turns story wise. But according to Pierce Brosnan (in the extra features on the blu-ray / Hong Kong press conference the franchise needed something fresh and more compelling to stand out from the previous films. And so Michael Apted was brought in to direct who indeed made the plot more vital and dramatic. Sure enough at the time the plot certainly felt intriguing. Not sure if first time watchers now will share that sentiment. Twists and turns are more rule than exceptions these days and even if you aren't a fan of thrillers and mystery films you will get them whether you like it or not. Problem with these plot devices is that they stop being effective after you find out about them. This could have been remedied had they actually tried to deepen the relationship between Bond and Elektra for example. Another flaw is the fact that Renard (Robert Carlyle) is underused. Plot wise there is an explanation for that. Sill he is hyped up to be very dangerous and yet hardly impresses in the few times he is on the screen. A point was made of his unique condition and that he can't feel pain and becomes stronger everyday. There are two scenes where he briefly demonstrates his pain tolerance but not his strength. They probably would save the best for last right? The final battle. Bond verus Renard. It's going to be epic. Wrong. The finale is easily among the weakest in the film series. There is no epic fight. The way Renard is taken out is uninspired to say the least. Apted should have had Bond and Renard battle it out the first time they encountered. Where Bond would give it his all and gets hurt badly but where Renard himself barely gets a scratch on him. It would have instantly made Renard a lot more menacing. Something I would turn back to with repeated viewings. What about the the action then? Unfortunately there aren't that many scenes that are worth your while. The action is adequate and solid. But nothing memorable. Apart from the opening sequence which features a boat that can dive under water and twist while jumping. The acting is good and I don't think Denise Richards is bad by any means. But naturally she can't compete with the more superior Sophie Marceau as Elektra. We get a nice little moment between Bond and Q where Desmond Llewelyn is saying goodbye to the franchise. John Cleese is introduced as the future replacement for Q and provides the usual mannerisms expected of him. Pierce Brosnan said he was having fun in his third outing as Bond and it shows since he seems more relaxed and comfortable cracking jokes. Judi Dench is good as always although I do have to say that she is far too accommodating. She is not on Bond's case as much as she could have. In previous films M berating Bond was one of the fun recurring elements.